Did you know that the small, pear-shaped fruit called the fig was once a favourite of Queen Cleopatra? Native to the Middle East and the Mediterranean, figs are probably amongst the healthiest foods and also one of the first to be cultivated. Their voluptuous shape, honey scented aroma and chewy taste stand a class apart from the rest of the fruits. With about 30 to 1,600 small, golden seeds per fruit, figs are regarded as a symbol of fertility in many cultures. A member of the Mulberry family, figs are botanically identified as Ficus carica and universally called the common fig or edible fig. The colour and texture of these fruits vary widely, such as shades of green, purple or brown. The flesh of the fruit is usually red, pink or amber. Due to their highly perishable nature, figs are sold in dried forms, throughout the year. Apart from the soft, sweet and pulpy nature of figs, they are involved in some serious health benefits to human beings. Take a look at some of them below. A native to Asia Minor or present day Turkey, figs were first cultivated in Egypt. The history of fig traces back to ancient writings and the Bible. This fruit became famous when Adam and Eve covered their nakedness with fig leaves; some scholars believed that the forbidden fruit picked up by Eve was a fig and not an apple. Sumerian stone tablets dating back to 2500 BC also indicate the usage of figs. Indigenous to Western Asia, the fig-growing territory stretched from Afghanistan to southern Germany and the Canary Islands. Gradually spreading to ancient Crete and then to Greece around the 9th century, figs became a staple food. As per the Roman myth, the wolf that took care of the twin founders of Rome, namely Romulus and Remus, rested under a fig tree. During that period, over 29 varieties of figs were already discovered. With time, ancient conquerors introduced figs to other regions of the Mediterranean and in the early 16th century, they were taken to the Western Hemisphere by the Spaniards. The missionaries, who worked in San Diego in California, planted several fig trees. From here, the fruits spread to Virginia, Carolinas, Georgia, Florida, Alabama, Mississippi, Louisiana and Texas. Today, Turkey, Greece, Portugal, Spain and California are the largest cultivators of figs. Figs are known to lower and control high blood pressure since they are packed with potassium, a mineral useful for controlling hypertension. People often complain of potassium deficiency and figs are an excellent source that can be added to their daily diet. Rich in calcium, figs enhance bone density. They help in overcoming the loss of urinary calcium and thereby preventing the bones from thinning out. Enriched with high quality dietary fiber, figs are extremely beneficial for the digestive system. In fact, it improves metabolism and keeps stomach related ailments like constipation and indigestion, at bay. Not only the fruits, but also the leaves of figs are beneficial. They help in lowering the levels of triglycerides, which are major form of fat produced and stored in the body. Increased triglycerides are often associated with obesity and heart disease. Figs contain a high amount of fiber compared to any other dried or fresh fruit. While insoluble fiber provides protection against colon and breast cancer, soluble fiber helps in lowering blood cholesterol. The fiber is also essential in reducing the risk of contracting chronic illnesses such as heart disease and diabetes. In addition, it adds bulk to stools thereby promoting proper bowel functioning. Since ages, figs have been used to reducing sexual weakness. Soaking 2-3 figs in milk is known to enhance sexual power. Fiber and fiber-rich foods such as figs promote weight loss and are highly recommended for obese people. However, when figs are taken with milk, they improve weight or induce weight gain. Elderly people often lose their eyesight due to macular degeneration. Fruits like figs are great in sharpening vision and keeping the risk of eye diseases away. 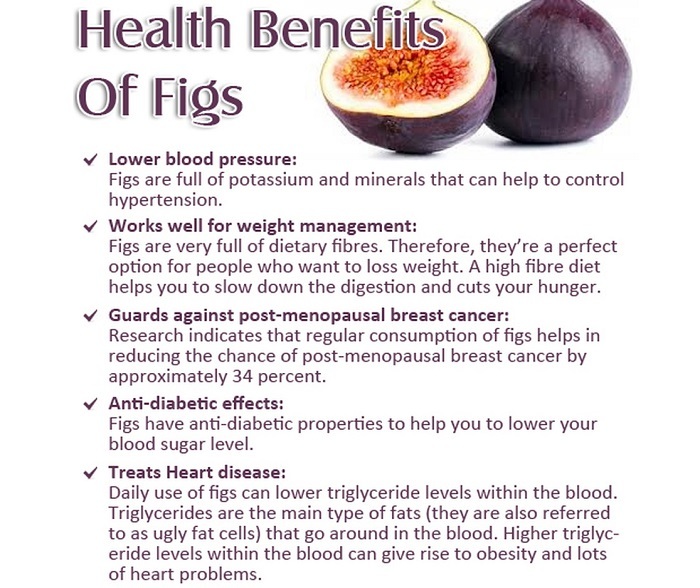 Studies reveal that figs help in reducing the risk of breast cancer in postmenopausal women. It was found that women who consume more fibrous fruits, such as apples, dates, figs, pears, and prunes, are at a lesser risk. 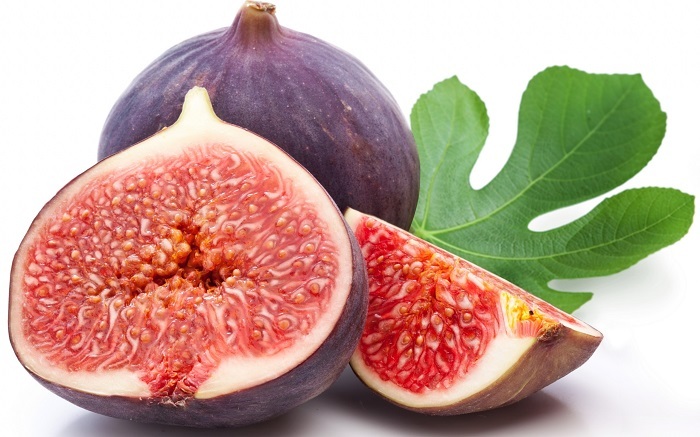 Figs have been quite useful in various respiratory disorders like whooping cough and asthma. Furthermore, they are also good in treating constipation, indigestion, stomach ache, fever, earache, boils, abscesses, venereal diseases and promoting good health of the liver. Figs have about 249 calories per 100 gm of weight. Figs are available in both fresh and dried varieties. Since fresh figs tend to deteriorate quickly, purchase them just 2-3 days before you wish to consume it. Always look for figs with a rich, deep colour where the flesh is plump and tender, but not too mushy. Figs should be clean and dry with a smooth and unbroken skin. Figs are harvested for a short period from mid-June to mid-October. It is best to purchase them 7-10 days after their harvesting. Smell the figs to check for their freshness and taste. In case they have a mildly sweet fragrance then you have picked the right fruit. However, any sour smell indicates that they have started fermenting. While buying dried figs, make sure that they are gently soft, free of mold and have a pleasant smell. Figs perish quickly and hence, must be eaten while they are still fresh. Alternatively, you can store them in a refrigerator where they will last for 2-3 days. Since figs have a delicate nature and can be easily bruised, arrange them in a paper towel-lined plate or a shallow container. Cover or wrap the fruits to ensure that they do not dehydrate. Place figs in the coolest part of your refrigerator for up to 2-3 days. In case you have bought slightly under-ripe figs then store them at room temperature and away from direct sunlight. Store dried figs in their original sealed packaging at room temperature for a month. To store them for a longer duration, place them in a refrigerator. This can be kept for 6 months to a year. In case you have opened the dried fig package, transfer the contents to a sealable plastic bag and store in the refrigerator.